The French town of Roubaix, has recently opened a series of portable hotel rooms in a local park. They can be rented by people who want to feel close to nature in the middle of the urban jungle. The bubble concept thought up by French designer Pierre Stephane Dumas aims to redefine the term temporary leisure accommodation, and is based on the following principles: minimum energy, minimum material, maximum comfort and maximum interaction with the environment. 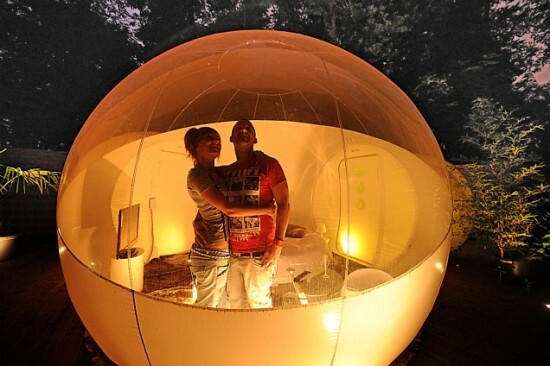 The unusual bubble rooms were launched in 2010 and have since then been made available to people who want to enjoy a unique experience in the middle of nature, for around $700 a night. 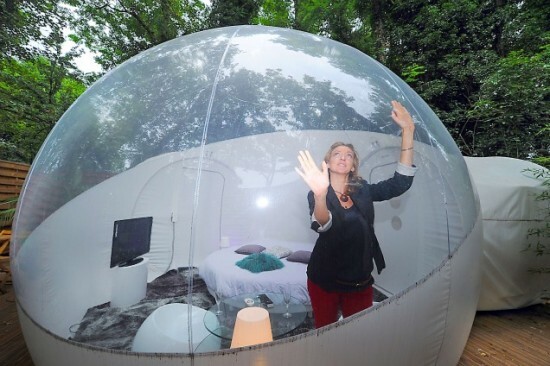 In the French city of Roubaix, a series of bubble hotel rooms have been installed in one of the local parks. They come with a clear view of the sky and offer nature lovers to be close to their environment without having to travel to far away. The bubbles are made of recycled plastic and, once inflated retain their shape thanks to an airlock at the entrance and a silent pump which creates constant pressure. Outside noises are reduced to a minimum while inside noises are maximized, so the visitors are encouraged to whisper to each other, in order to create a peaceful atmosphere.